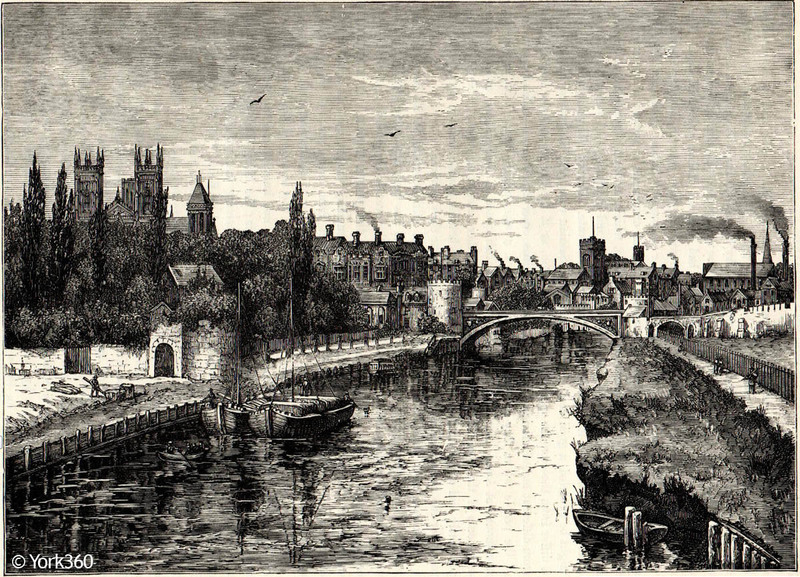 This page highlights a 'brief' background to the history of York. 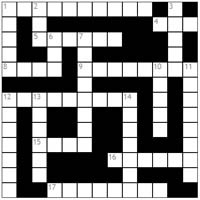 It should only be used as a starting point if you are interested to find out more. York was founded during the reign of the Roman Emperor Vespasian in AD71 and for much of the intervening period has been the principal city of Northern England. 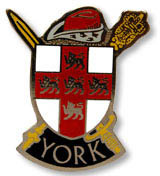 York was named Eboracum by the Romans. 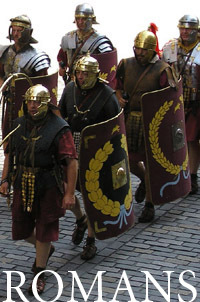 Eboracum was a major military base on route to Scotland. York was to become so important in Roman Britain that a royal palace was built and the emperor Septimus Severus stayed here with his imperial court in the years 209-211. 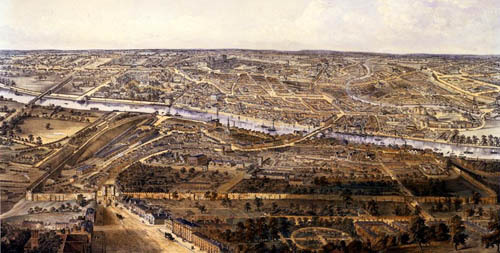 By the 4th century Eboracum was the capitol of southern Britannia. The Emperor Septimius Severus died here in AD211 and was then succeeded by his sons, Caracalla and Geta. Constantius Chlorus, the father of Constantine I, also died here in 306. 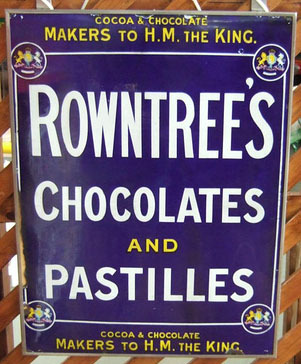 York is also the city in which Constantine's troops proclaimed him emperor. Substantial remains of the headquarters building of the Roman legionary fortress were discovered underneath where York Minster stands today. A Roman column which was found now stands on nearby Deangate, where there is also a statue of Constantine. Other sites of excavated remains include a Roman bath, located under the Roman Bath pub in St. Sampson's Square, a Roman Temple, near the foot of Lendal Bridge, and the site of a Roman bridge over the River Ouse. Some remains of the Roman city walls can be seen between Monk Bar and the Merchant Taylors Hall, and a more substantial section can be seen between Museum Gardens and the Central Library, together with the Roman Multangular Tower. Outside the city walls are the remains of Roman cemeteries near The Mount. 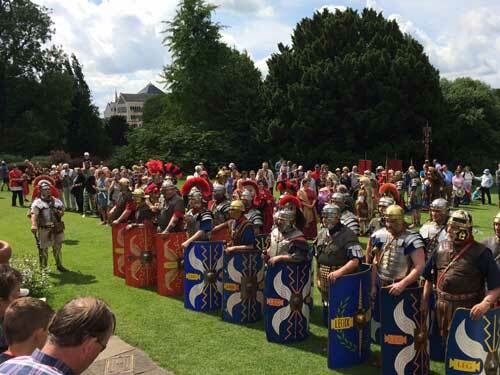 A large number of Roman finds are now housed in the Yorkshire Museum in Museum Gardens. Where can I find out more about Roman York? (above) The Roman Multangular Tower in Museum Gardens. 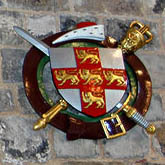 York (Jorvik) had been founded as the Roman legionary fortress of Eboracum and revived as the Anglo-Saxon trading port of Eoforwic. It was first captured in November 866 by a large army of Danish Vikings, called the "Great Heathen Army" by Anglo-Saxon chroniclers, which had landed in East Anglia and made their way north, aided by a supply of horses with which King Edmund of East Anglia bought them off and by civil in-fighting between royal candidates in the Anglian Kingdom of Northumbria. Declaring a truce, the rivals for the throne of Northumbria joined forces but failed to retake the city in March 867, and with their deaths the kingdom Deira came under Danish control, and the Northumbrian royal court fled north to refuge in Bernicia. A Viking attempt against Mercia the same season failed and in 869 their efforts against Wessex were fruitless in the face of opposition from Kings Ethelred and Alfred the Great. Where can I find out more about Viking York? York Viking Centre has many artifacts found in York archeological excavations. Jorvik Viking Festival, held in February. 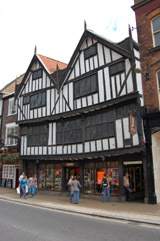 Medieval York had over 100 different trades & crafts, but only about 50 - 60 had a Guild organisation. Each guild was concerned with the organisation of a single trade or group of related trades, and with policing its members' activities through training (by apprenticeship), regulating standards of workmanship. 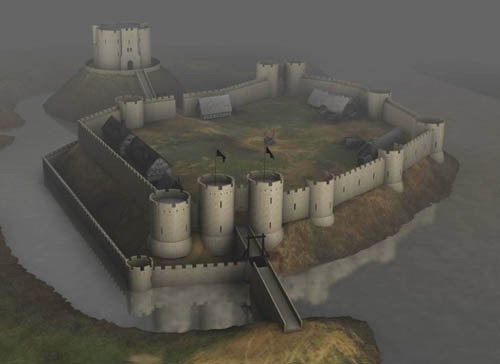 (above) An artists 3d impression of York Castle c1244. 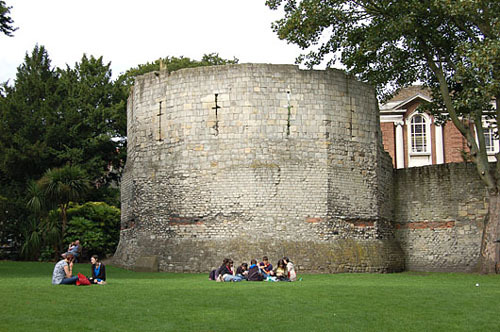 William the Conqueror first built a castle on the site in 1068 to subdue the north. This was a Motte and Bailey style castle and would have been made out of wood. This building stood for just over a century before being burnt down in one of York’s bloodiest and most tragic moments, when in 1190, 150 Jews were massacred on the site. Between 1190 and 1194, it was repaired at great expense, and the mound was raised to its present height. The second timber structure was destroyed (this time by a gale). It wasn't until 1244, with the threat of war in Scotland, that the entire Castle was rebuilt in stone. This included the new keep at the top of the mound, which later became known as Clifford’s Tower. 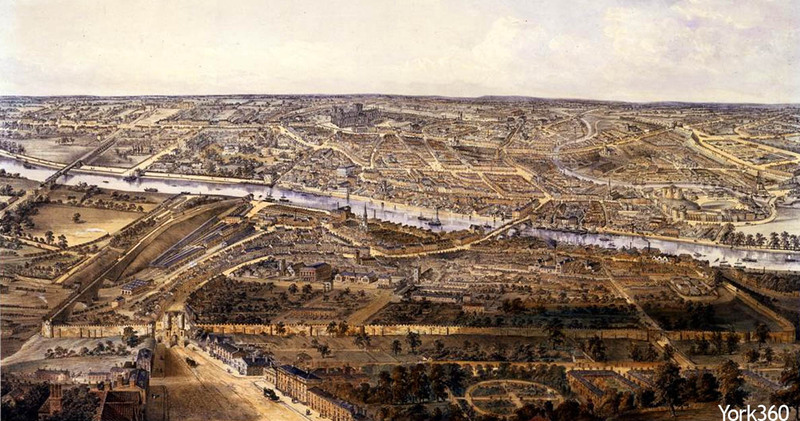 The fortifications took around 20 years and £2,450 to complete. A huge stone wall with basitons and two large gatehouses surrounded the bailey. There were also stone bridges across the moat to the gatehouses. Today, the most impressive remains are of course Clifford’s Tower. But other parts of the castle can be seen including large parts of the wall and the two towers that stood on either side of the southern gatehouse. The Battle of Towton was the bloodiest ever fought on British soil, with casualties believed to have been in excess of 20,000 men. 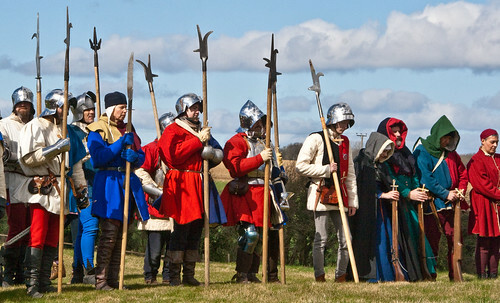 The battle took place on a snowy 29th March 1461 (Palm Sunday) between the villages of Towton and Saxton about 12 miles southwest of York). 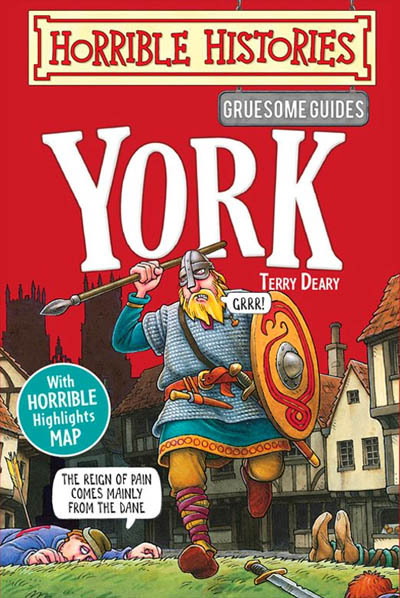 Where can I find out more about Tudor York? Unknown artist. Oil on panel. Late 15th century. (638 mm x 470 mm). 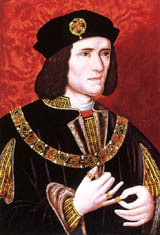 As brother of King Edward IV, Richard was awarded the title Duke of Gloucester and Governor of the North, rewarded with large estates in northern England, becoming the richest and most powerful noble in England. 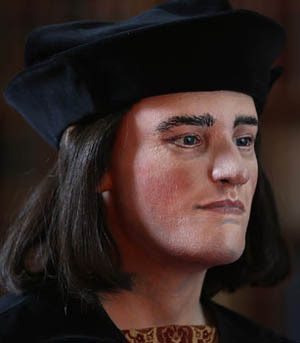 Later becoming King from 1483-1485, until his death at The Battle of Bosworth. Guy Fawkes born in York 13 April 1570. Infamous for the Gunpowder Plot to blow up the Houses of Parliament. 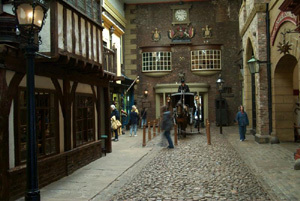 Kirkgate, a real Victorian Street. (above) 1890 Antique Wood Print Engraving. 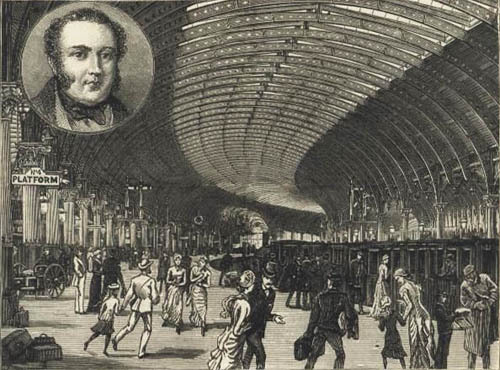 The railway station was originally inside the city walls. 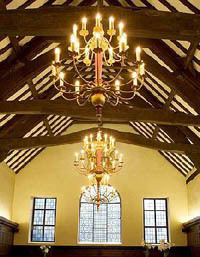 Victorian Architecture that can be seen in York. 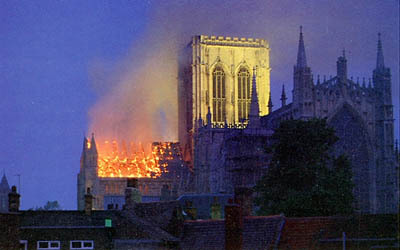 On Monday 9th July 1984, a fire caused by a lightning strike destroyed the roof in the south transept of York Minster. £2.5 million was spent on repairs and restoration work was completed in 1988, including new roof bosses to designs which had won a competition organised by BBC Television's Blue Peter programme.